Want to see some mumbling and hand waving? Ask a dozen instrument-rated pilots to explain “… for climb in visual conditions …” in the textual departure procedures for an airport. It’s not their fault. Departures, in general, are the overlooked middle child of instrument procedures, which makes the Visual Climb Over Airport (VCOA) akin to the weird uncle who shows up at Thanksgiving and gets politely ignored. The key is that a VCOA is an alternative to the obstacle departure procedure (ODP). You do one or the other, but not both. You must also inform ATC you’re planning on flying the VCOA when you request your clearance. Step one on that planning process is determining if obstacles are even an issue. Every airport that has a published instrument approach has also been surveyed for departures. It’s assumed that an aircraft will cross the departure end of the runway (DER) at 35 feet AGL, and climb to 400 feet AGL on runway heading, with a climb gradient of 200 feet per NM. This creates a point in space. The survey then asks, if the aircraft continues to climb at 200 feet/NM, could it turn in any direction on course and maintain required obstacle clearance? For airports in the middle of Nebraska and other level places, the answer is usually, “yes.” This means the runway qualifies for a “diverse vector area,” and no departure procedure is published. This older term for this is a “diverse departure,” and that makes more sense from a pilot’s perspective. You can depart in any of a diversity of directions, so long as you keep climbing at least 200 feet/NM. The survey is done for every potential departure runway, and if all qualify for a diverse departure, the airport might not even appear in the departures section of the terminal procedures. If a departure runway fails this test, a remedy is published. This simplest fix restricts how early the aircraft can turn, such as the procedure for Runway 24 at Conrad, MT (S01), where the aircraft must climb on runway heading to 4300 feet MSL—after which, it may continue to climb on a diverse departure. That second part is key: Almost all ODPs get you to a point from which you can continue to climb at 200 feet/NM up to your assigned altitude. If you’re departing Runway 06 at S01, it’s a diverse departure from the standard 400 feet AGL. Another remedy is defining a higher required climb gradient. The bottom of the entry for Corvallis, OR (KCVO) shows Runway 17 has a normal diverse vector area, but Runway 35 requires 210 feet/NM to 800 feet MSL. The implicit part is that above 800 feet MSL, the required climb gradient reverts to 200 feet/NM. If a simple fix won’t do, a more complex departure procedure might be published. Sometimes this is a fully charted procedure, which is worthy of its own article. However, the more complex departure is usually a textual procedure. 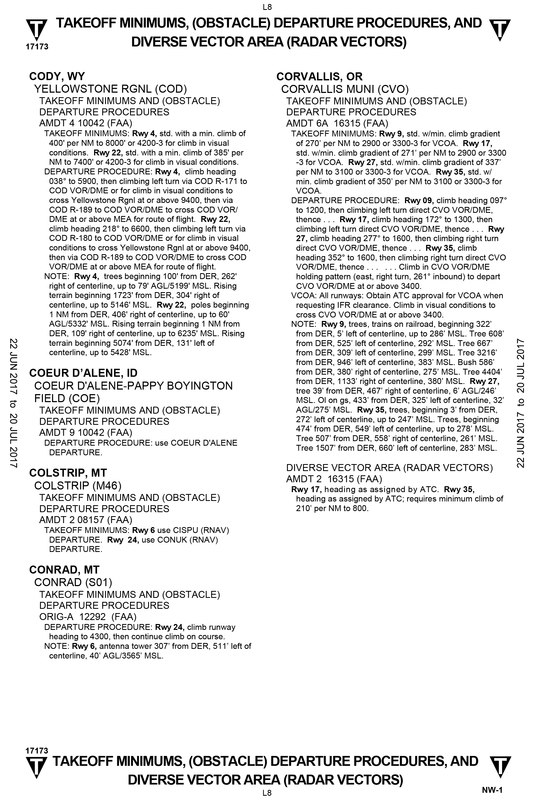 For KCVO, there’s one textual procedure for each of four runways. Runway 09 requires you to climb on heading 097 to 1200 feet MSL, before turning left, back to the CVO VOR as you continue to climb. The other runways are similar. Further down in the text, it notes that all aircraft should climb in a hold on the 261 radial inbound until 3400 feet before departing on course. That on-course departure is … wait for it … a diverse departure from 3400 feet MSL over the VOR. It’s assumed you’ll continue to climb at 200 feet/NM to your assigned altitude. When do you start flying a heading of 097? These procedures all start at 400 feet AGL, so that’s your starting point. However, there’s one more essential requirement. Even though the takeoff minimums for ceiling and visibility technically don’t apply to Part 91 ops, the climb gradients in here do. At least, they do if you want to keep space between tree branches and the empennage. Departing Runway 09 at KCVO on the published departure procedure requires a climb gradient of 270 feet/NM to 2900 feet MSL. Above 2900 feet, it’s the standard climb gradient — but you must continue flying the ODP until over the CVO VOR and above 3400 feet before turning on course. The takeoff minimums section is where we finally find the VCOA. For each runway, the requirements for flying the VCOA are ceiling 3300 feet AGL and visibility 3 miles. Barring any further restrictions, if you can climb in visual conditions to 3300 MSL directly over the airport, from that point on you could continue to climb in the clouds on a diverse departure. That’s because the goal of a VCOA is to raise the floor of the diverse departure and place its starting point directly over the airport. Get there however you want by avoiding obstacles visually. Then, from that point, continue on course climbing 200 feet/NM. That’s the goal, but for KCVO, there’s one last twist. At the bottom of the departure procedures section, it says, “VCOA: All runways … Climb in visual conditions to cross CVO VOR/DME at or above 3400.” This seems contradictory at first: The VCOA requires a ceiling of 3300 feet but you’re supposed to climb in visual conditions to 3400 feet? It’s AGL versus MSL: 3300 is feet AGL because it’s a ceiling, while 3400 is feet MSL because it’s an altitude you read on your altimeter. KCVO is about 250 feet elevation. Slide over to Cody, WY (KCOD) by Yellowstone (I hear there are some hills around there), and you’ll see the uncommon “routed VCOA,” meaning it has a departure you follow even after you enter the clouds. Spiral up over the airport to 9400 feet MSL, and then proceed via the COD VOR 189 radial inbound to cross the COD VOR at or above the MEA. KCOD also shows how a VOCA can really pay off. The ODP climb gradients are 400 or 385 feet/NM to altitudes of 8000 feet MSL or 7400 feet MSL, respectively. This requires an 800 foot-per-minute climb, if you have a 120-knot groundspeed. Many light aircraft can’t maintain that climb at 7000 feet MSL. The VCOA has no required climb gradient until you reach the on-course altitude, after which it’s only 200 feet/NM. Ignore the published ODP routing and take as long as you need to climb. Enjoy the view — and use it to stay off the rocks — as you do. As with KCVO, don’t let the VCOA ceiling of 4200 feet and the spiraling up to 9400 feet phase you. KCOD’s airport elevation is 5102 feet. But, you say, that means there’s a 100-foot difference between the required ceiling (9302 MSL) and the 9400 climb-to altitude. Yeah, that happens. How you climb for that last 100 feet is up to you. Just stay over the airport. And that’s an interesting point, because, technically, Part 91 flights aren’t bound by takeoff minimums or required to follow ODPs. You could take off in your Cirrus on a private flight on a zero-zero and spiral up over any airport, whether a VCOA is published or not. I wouldn’t recommend it, but at least your estate can claim you didn’t break any rules. For the rest of us who like options that offer a bit more buffer for safety, check out the VCOA, if published, as an alternative way to avoid the rocks before you climb into the clouds and proceed on your way. We don’t have climb gradient instruments in our aircraft. (Although, a terrain display can be a life saver.) Instead, we have climb rate instruments. Converting is basic math of groundspeed/60 multiplied by the climb gradient. For a groundspeed of 90 knots, the standard climb gradient of 200 feet/NM converts to 300 feet/min (90/60 * 200). If you know your climb rate for the standard gradient, you can do a quick estimate for non-standard ones. If the required gradient is 375 feet/NM, round up to 400 feet/NM, which is twice standard. Assume you’ll need 600 feet/min, if you expect 90 knots groundspeed. Just remember that it’s groundspeed, not airspeed that matters. You must factor winds into your departure planning. It’s also average climb rate that matters. If the departure requires 600 fpm while you climb and you see 700 fpm initially that drops to 590 fpm for the last 1000 feet before you join the airway, you should be fine. Not that you could do much about it at that point anyway.